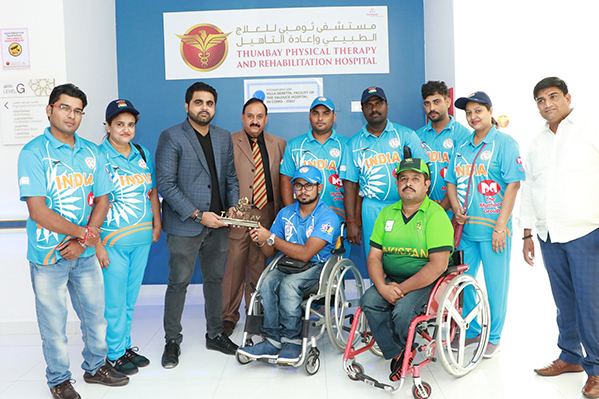 Thumbay Physcial Therapy & Rehabilitation Hospital, the biggest and most advanced hospital for physical therapy and rehabilitation, had the pleasure of hosting Indian and Pakistani Wheelchair Cricket teams on 18th September 2018. The team members were received at the hospital by Mr. Akram Moideen Thumbay, the Chairman of Thumbay Group’s Corporate Social Responsibility (CSR) Committee. The visiting Indian and Pakistani players were all praise for the cutting-edge physical therapy and rehabilitation facilities of the hospital. Mr. Akram Moideen Thumbay felicitated the players and honored them with mementos. One of the team members, Mr. Abhai Pratap Singh, former Squardon Leader at the Indian Air Force got the greatest surprise of his life during the visit, as he was able to walk on his own, 11 years after a devastating accident which had paralyzed his body below the waist and confined him to the wheelchair, ending his career as an airman. Abhai’s wish to be able to walk again came true at Thumbay Physical Therapy and Rehabilitation Hospital, as he tried one of the innovative rehab technologies available at the hospital, the Ekso Bionic Suit. “After 11 years, I am walking again. I’ll cherish this memory forever,” Abhai said, overjoyed. Operating under the healthcare division of Thumbay Group, the Thumbay Physical Therapy and Rehabilitation Hospital (TPTRH) is a teaching hospital and an Academic Health Centre under the Gulf Medical University Academic Health System (GMUAHS). State-of-the-art rehabilitation treatment is delivered through advanced technology like virtual reality. The hospital operates in collaboration with internationally renowned Villa Beretta Rehabilitation Center, Department of Rehabilitation Medicine, Valduce Hospital, Italy. It is attached to Thumbay University Hospital Complex, having 50 dedicated beds especially for rehab. The outpatient department of the hospital offers Neurocognitive Rehabilitation, Sports Medicine and Orthopedic Medicine. The hospital features state-of-the-art amenities for physical therapy, such as Hydrotherapy Pool, Robotics and a unique Cryotherapy Chamber and a unique ‘Therapeutic Garden’. 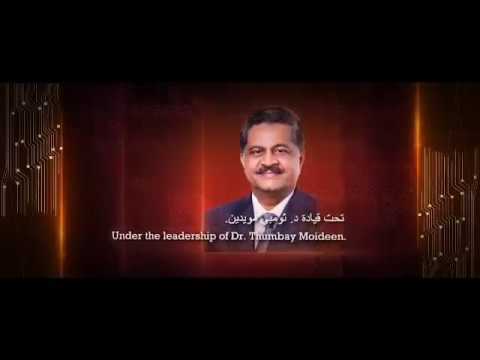 Thumbay Medicity houses the Gulf Medical University, Thumbay Labs, Thumbay Pharmacy, Blends & Brews Coffee Shoppe, Body & Soul Health Club and Spa, Thumbay Food Court, Thumbay Housing Project, Theatre, Center for Advanced Simulation in Healthcare (CASH), Thumbay Research Institute for Precision Medicine (TRIPM), Central Library, Research Center, Free Parking, Public Bus Station, Supermarket, Thumbay Dental Hospital and Thumbay Physical Therapy and Rehabilitation Hospital. A 500-bed academic hospital – Thumbay University Hospital – the largest private academic hospital in the region is at the final stages of completion at Thumbay Medicity, slated to open shortly. The specialized hospitals of Thumbay Medicity are Academic Health Centers of the Gulf Medical University Academic Health System (GMUAHS). 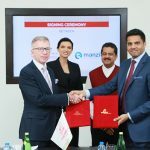 According to Dr. Thumbay Moideen, the Founder President of Thumbay Group, Thumbay Medicity will have a floating population of 20,000 daily, availing its state-of-the-art healthcare, medical education and research facilities.